In the new millennium Global Managers have a unique role to play. In the fast paced and ever competitive world they have to provide. " Not just transactional but also transformational leadership." "They will have to manage with the left and lead with the right". MERIT promises a whole brained approach to Managerial Education. The emphasis will be on pragmatism and synergy. Cool, Airy class rooms, warm friendly Faculty who will be experts in their domains, well stacked library, continuous interactions with the Captains of the Industry, Think - Tank Sessions, Seminars and Panel Discussions are just some of the many "FIRSTS" and "RESTS" of MERIT. 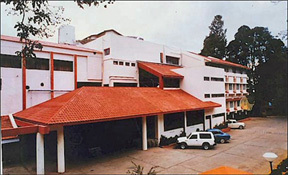 Merit International Institute of Business Management is housed in the MERIT CAMPUS at Ooty, which already consists of the Merit Swiss Asian School of Hotel Management, offering both Under Graduate and Post Graduate Programs. It also has an attached prominent star hotel, MERIT- INN SOUTHERN STAR. Two years(Four Semesters) MBA in association with Alagappa University, Karaikudi. The University in recognized by University Grants Commission (UGC) and a member of Association of Indian Universities (AIU). Students simultaneously pursue a two year (four semesters) , full time, Post Graduate Diploma in Business Administration (Equivalent to MBA) from MERIT INTERNATIONAL INSTITUTE OF BUSINESS MANAGEMENT with specializations in four streams. For the PGDBM course, dual Specialization (optional) is also offered in Hospitality & Tourism Management. MBA students also have an option of completing the final year course at Switerland to obtain a Swiss post graduate degree. Students taking up this option can complete the Indian University degree examinations after the course completion in Switzerland. The candidate applying for admission to the Post Graduate Program in Management must have a minimum qualification of Bachelor's Degree in any discipline recognized by the Association of Indian Universities, with minimum 50% aggregate marks.Final year students awaiting results are also eligible to apply.